Not just a rental. It's our home, and we want you to enjoy it! 2nd floor Great Room with cathedral ceiling. Lots of space! Fabrics are family-friendly indoor/outdoor, so no worries. Ocean view from picture window. Wet bar area with pub seating. Ambiance! Don't worry, seats have kid-friendly outdoor fabric. 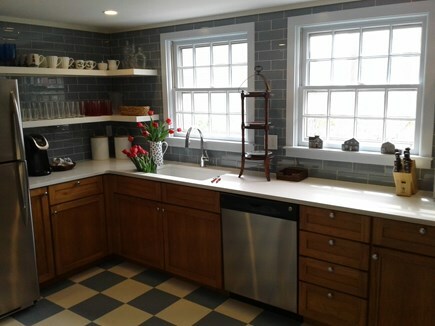 Remodeled Kitchen with quartz, stainless and open shelving. 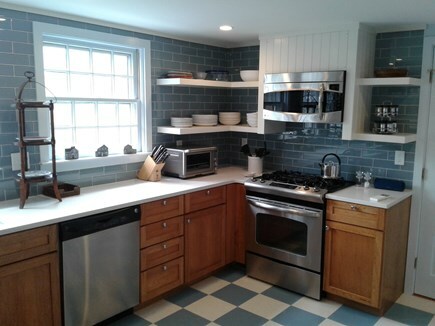 Includes dishes, glasses, cookware, bakeware and a lobster pot. 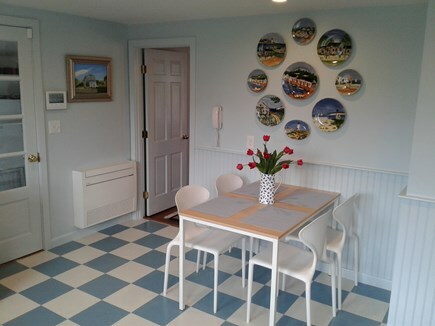 Casual dining space in large kitchen with pantry. 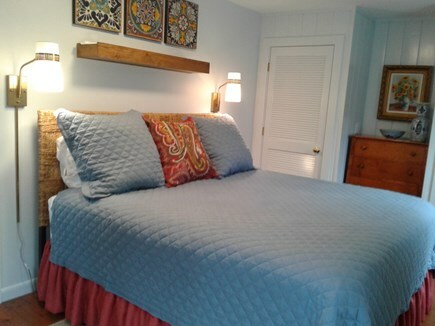 Cozy, king bed in Master Bedroom. The mattress is brand new. Relax, unwind, read. And yes, the chairs are outdoor fabric. 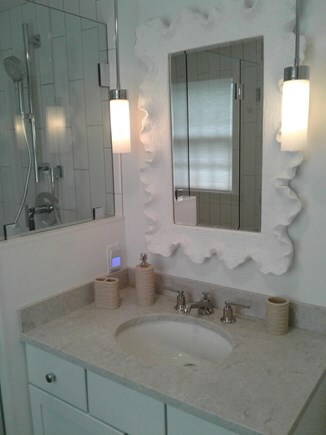 Complete remodel of Master Bath. Large, tiled shower. 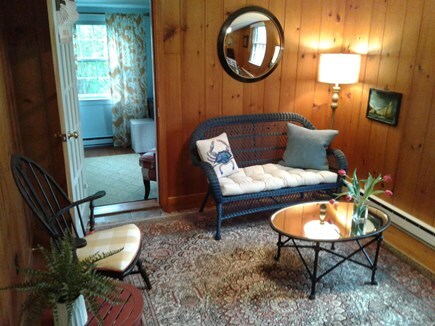 1st floor Guest Bedroom has a king bed and new mattress. Beach-y fun Bunk Room with a large closet and dresser. 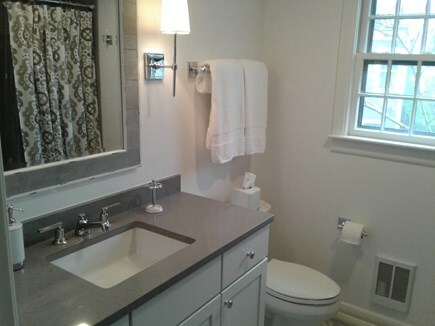 Complete remodel of Guest Bath with soaking tub/shower combo. 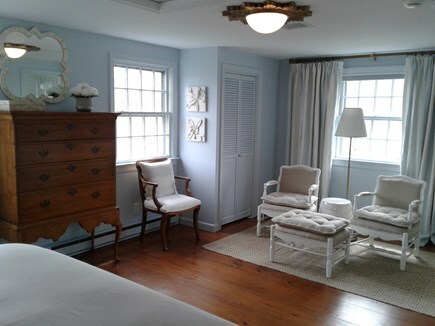 Den just outside Guest Bedroom could be a nursery. Another TV for kids to watch a movie or play video games. Deck with dining table and grill. Built in bench coming soon. 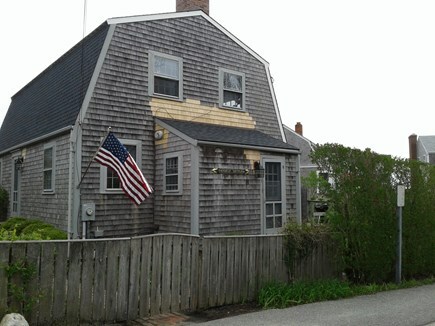 Located in the heart of the village and just 150 yards from the beach. 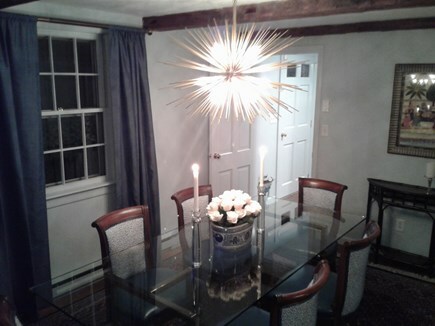 Just completed, whole house renovation. Virtually everything is brand new!!! This light and bright home is ideal for 2 families to share or for mom, dad, kids and grandparents as there are 2 king bedrooms! 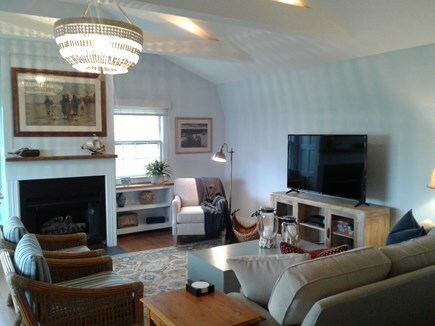 The first floor has a large eat-in kitchen with open shelving, quartz counters, stainless appliances, a gas range, pantry, Keurig coffee maker, Ninja blender/food processor, new cookware, bakeware and lobster pot. Dining room seats up to 8 with durable outdoor fabric seating. 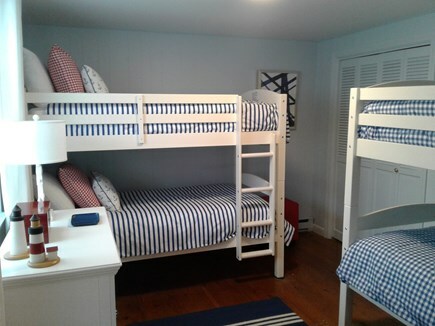 The bunk room has 2 sets of bunks, a dresser and large closet. Full bath with tiled walls and floor and deep soaking tub/shower combo. 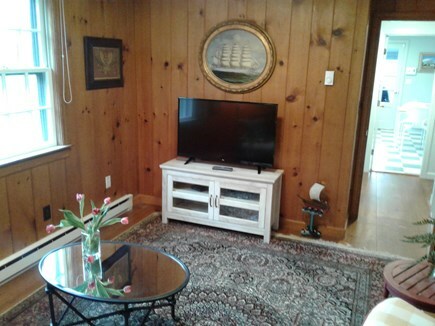 A den with 32'' cable TV that could be used as a nursery (no crib or pack n play provided). Through the den is a king bedroom with new mattress, dresser, 2 closets and dressing/vanity area. 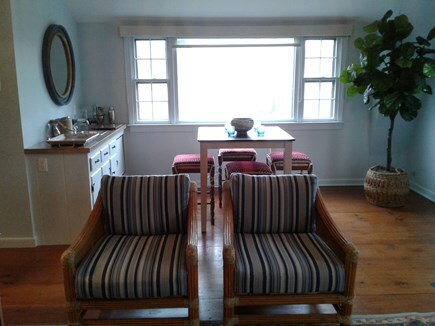 Second floor has a light-filled great room with partial ocean view from large picture window. 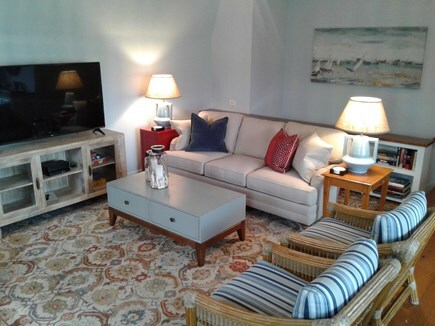 Plenty of seating all in durable outdoor fabrics, 55'' cable TV and wet bar area with pub seating. 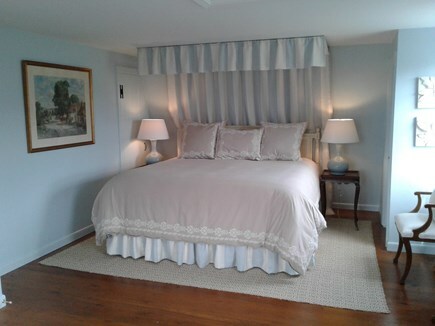 The master bedroom has a canopied king bed with new mattress, highboy, 2 closets and seating area. The master bath has over-sized tiled shower and floor. 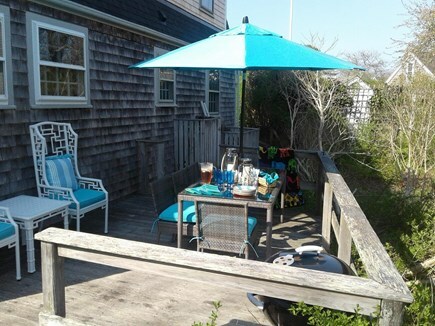 Outside you'll find a shower and a deck with a dining table for 8 with an umbrella and additional seating. 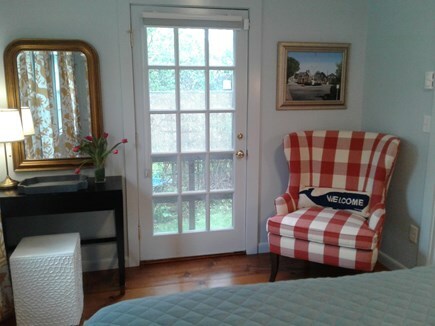 There is central A/C, heat, full size washer and dryer, dishwasher, on-demand (tankless) hot water, state of the art Sony bluetooth speakers, cable TV, Internet, a BBQ grill, and plenty of beach towels, chairs and coolers. Additional pricing info: $300 cleaning fee. $500 damage deposit. Pay by certified check, overnight delivery or wire transfer. State and local taxes of 11.7% will apply.